Dave: "I completed my Graflex Crown Graphic kit with 3-cell Graflite [a.k.a. 3-cell Graflex flashgun —Ed.] and Instant film back (the Fuji PA 45). It is the 'anti-Instagram.'" Daniel Clements: "A Pinwide 'lens ' for my Micro 4/3 camera." kirk tuck: "Son Ben got me a Yellow Brick Road Holga (from the Holgawood Collection). I guess he thinks I take the existing medium format stuff too seriously...I got myself two more Fotodiox Pro LED 312AS panels (current Gold Box deal at Amazon...) you can never have too many good LED lights around the studio...."
Dave: "I got a Mark 3!!! I had been shooting with a 5D classic since 2007 and thought I would never get a new camera—or at least not until tax returns. My wife completely surprised me Christmas morning. So far, I'm really happy with the Mark 3. ISO 800 looks cleaner than ISO 100 on my 5D classic. We have a baby due in less than a week. That high ISO performance is gonna come in handy in the delivery room." Mike replies: Congratulations on the new baby! And on the new baby! Dave in NM: "Nothing even remotely related to photography; just the pleasure of sharing a good meal with my little family, and the joy of seeing my daughter's face as she opened her gifts. What more could you ask for?" Mike replies: That, plus a new camera to take a picture of her face with? Just thinking out loud. Sorry, am I being too much of an enabler? David Bostedo: "I got Polar Obsession by Paul Nicklen :-) "
Mark Roberts: "A hiking trip in the Italian Alps :-) "
MarkR: "500 Cameras! Wonderful book my wife picked up for me at the George Eastman house. "It does beg the question, however: Frank Brownell got to name the camera he designed after him, and the world got the Brownie. Arthur Crapsey designed a camera, and it got named the Signet. Unfair?" Mike replies: I just saw a new DAC from a company called Schiit. No...er, well, foolin'. Ann: "The Ray K. Metzker book...lovely! Plus new swimming goggles and some girlie things. Merry Xmas!" Marc Rochkind: "After obsessing over viewfinders, selling my Olympus E-P1 for a Panasonic G3 because of its EVF, but still wishing I could see like I can with my Nikon D700...I got a camera with no viewfinder at all! It's a GoPro. I just picked up a head strap for it, and tonight I'll be playing tennis with the camera strapped to my forehead. We don't need no stinkin' viewfinders!" Patrick: "I got my usual Christmas 'gift,' a lot of needless family drama. On the plus side, I bought my mother (who is also an avid photographer) the fish-eye lens she's wanted for a number of years. Never underestimate the power of a fun lens." Robert L.: "I got nothing but photo opportunities. However my son (almost 6) got his first camera, a Panasonic LX-3, with a an old Petri Viewfinder to mimic my X100 (his is silver as well). Pretty sure the appropriate phrase is 'over the moon' :-) "
Friedrich: "I sold my camera, lenses, flash etc. for christmas. I realized it was making me unhappy that I didn't use it nearly as much as I thought I would. I don't like having things that don't improve my life, so I finally, after a year of deliberation, admitted to myself that I am not a photographer (even though I know everything about technology and at least something about technique), and put it up for sale. Merry Christmas and a happy (and hopefully relatively unburdened by the past) new year everybody." Christine Bogan: "I got the 15mm cap lens for my olympus pens. It's a real toy. The other present is a metz flashlight to learn more about picturetaking with flashlight. Not my prefered way of photographing up to now. There is always something to learn in photography. That's a good thing for a hobby. The best present like every year is our christmas tree." Mike replies: Christine, have a talk with Friedrich about what a good hobby this is, would you? JohnMFlores: "I usually discourage photographic gifts because I don't think that I can deduct them. Alas, my wife did buy me a copy of The Photograph as Contemporary Art because she was clever enough to look at my Amazon wishlist. Looking forward to reading, as I'm looking to push my photography further in 2013. "I did set up a POV camera at the homestead on Christmas eve and made a timelapse of the children opening up their gifts." Vivian Maier book. It's very nice. I got one of those nifty little mFT 15 mm f/8 lens/body cap things. I don't think it's likely to rival my 20 mm or 45 mm for IQ, but it's highly amusing. It basically turns a moderately sophisticated ILC into a manual-focus phonecam. Worth it for fiddle value even if I never shoot a keeper with it. Well, happily a Fujifilm X-E1 with Fujinon 35mm 1:1.4 made it safely down the chimney, although apparently Santa missed the collection point on the Czeck border for the Sinar Macro Sinaron SE 5.6/180 to arrive on time. They're possibly wary these days of anyone displaying so much red. Season's Greetings to all at TOP. 12-35mm f2.8 Panasonic for the 0MD and 2 books through your links: the Minor White Aperture book and the Digital Negative by Schewe. All hi ok'd keep me busy. Have a great New Year Mike! However, my grandmother found an old Zeiss Nettar folding camera that she gave to me. Its a 6x6 and the shutter works, but the bellows are a little ragged and the lens is pretty foggy looking. I'm going to patch it up the best I can and run a roll through it to see how it works but if nothing else it will look handsome on the shelf next to the other inoperable cameras I have. Then the 312AS was marked way down on Amazon, for today only. And my wife encourage me to order one. Does that make it a Christmas gift? Sort of. From myself: NEC Multisync PA241 w/spectro, purchased through your B&H referral link. A couple bings of green pu erh. From my family: A couple Amazon gift cards that got turned into Eliot Porter's book, some new underwear, and a flashlight. Unfortunately not purchased through your referral link. Vivian Maier - Out of the Shadows. I cried. I can't believe how great these photos are. I think she may be the best photographer of the 20th Century. Happy Stephens day, (Irish tradition). I got a nexus 7. Nice screen, nice size. Pictures look smashing, apple type snobbery aside. Bought a Sony RX-100 at Thanksgiving as an early Christmas present to myself. Loving it! "12-35mm f2.8 Panasonic for the 0MD"
Oooh. You're going to have to let us know what you think of that. - An Impact 60" convertible umbrella (purportedly for off-camera flash, but conceivably large enough for rain protection as well). - Three books: The Photographer's Eye, The Photographer's Mind, and the Photographer's Vision - all by Michael Freeman. So far I am really enjoying these thoughtful essays on composition, style and the "art" side of photography. I received my second copy of the O. Winston Link photo book. Apparently it lingered too long in my Amazon wish list where it was spotted by a family member. I'll see if the library wants it. The legendary Heliar lens from 1929 for my Gowlandflex 4x5 TLR. Now all I have to do is figure out how to mount the beaut on the beaut. got a nice pair of wool socks and a photo album that I need to fine a worthwhile use for. Nothing. Yet. Waiting to see if Fuji announces anything in the next week or so. Photo books: Robert Adams, "The New West"; Mitch Epstein, "American Power." Lightroom 4. Couple of those archival print boxes. Got myself a (used) Crumpler Tallee bag. I got pants, which are good to wear when taking pictures as opposed to wearing a brace of live badgers gaffer taped to your midsection. "Mike replies: That, plus a new camera to take a picture of her face with? Just thinking out loud. Sorry, am I being too much of an enabler?" Aside from daydreaming every now and then about gear that I know is clearly unattainable, I'm not really afflicted with Gear Acquisition Syndrome. With a few good lenses and bodies, I've got everything I want or need, photographically. I'm limited only by time and ability. Did I ever mention how much I hate autocorrect? ( although it can be amusing.) This ..."All hi ok'd keep me busy. " is a fine example. S/B "All this should keep me busy". Got a Sony Nex-7 and Fotodix Nex-FD adapter to put my old school Canon macro FD lenses on. Having lots of fun looking at that spectacular viewwfinder and avoiding getting back to my usual work routine! Santa brought me a new ballhead (Manfrotto 498RC2), a used camera (Sony A65 along with several old Minolta lenses), and a few little accessories. And of course by "Santa" I mean "myself". A very very sweet little Voigtlander Vito B with the Color-Skopar lens. I had one a long time ago, and always was enamored with the beautiful crisp quality of the images with that wonderful lens. Yeah, it's not an Ultron, but it's certainly fine enough for me. I think the Ultron would always stay ahead of my capability to use it to its fullest anyway! Very happy with this little gem. Santa was not terribly creative this year and (s)he brought nothing photographic. 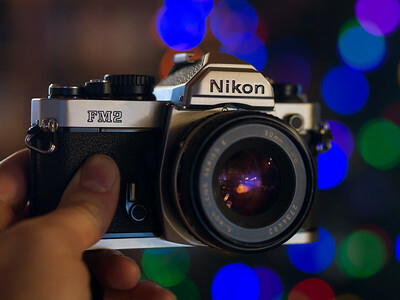 Tempted to offset the disappointment by treating myself to a Nikon FM3a or FM2/T during the 12 days. 28 Summicron. Not really a Christmas present, though. I'll be selling a bunch of other stuff to pay for it. Bye-bye Elmarit, bye-bye Ultron. Bye-bye, bye-bye. But Hello Summicron -- preliminary pix are all that I hoped they would be. I got a D600 with the 'kit' lens. Bori ng I know. But the camera is great (make that awesome). I can finally shoot indoors at ISO 3200; and ISO 6400 is eminently usable! A mint (used) Canon EOS 3 coupled to the 50mm f1.4 lens. Coming from the Olympus OM1, it's shockingly big. Looking forward to putting a roll through it once I venture out of the house. And I got the Vivian Maier book too. Bit of a trend there? From myself: A MacBook Pro with 15" Retina screen for viewing photos taken with the X-Pro1 bought in October. The Retina screen is beautiful and grainless to the naked eye but reveals lots of flaws! Replaces a seven year old Dell D610 laptop running Windows XP. But I'm new to Macs. No arrows or Xs to be seen. Hmm. And my girlfriend gave me the new book "Looking at Ansel Adams" by Andrea S. Stillman that you reviewed. Very nice; looks like a great read. My mom bought me a Panasonic 20mm f/1.7 for my E-PL1!!!!!!!!!!!!!!!!!! A fantastic 2 and 1/2 stop ISO improvement, and it even fit in my stocking! * And, she bought it through your B&H affiliate link. My wife bought me a pair of inexpensive radio flash triggers (w/ PC-synch socket too), so I'll be set for the occasional studio project. My grandfather is going to order Lightroom 4, for me, so I'll be able to bend those files like putty. Really, I don't have any gear wants left, not useful ones anyway. Sure, now the 14mm f/2.5 is calling my name, I could use a pigment inkjet printer, and someday I'd like to get something APS-C or FF for portraiture, but really, there's nothing left to stand between me and my photographic vision. Nothing! I am both encouraged and intimidated. No more shopping, no more debating pros and cons, no more puzzles like that to solve. No more excuses or justifications, either. Of course, the main lesson is that my family really loves me, and wants me to succeed. For that, I am really grateful. *Though I now discovered that the combo underexposes by at least 2 stops outside in the snow. I honestly thought that it's metering was smarter than that, but it's been so long since I've used this camera in snowy conditions, that I don't know if that's the case. Among the books is "Battlefields of Honor: American Civil War reenactors" with photos by Mark Elson. As to the "honor", I have a Northerners' viewpoint. And my primary interest in the book is for Elson's usage of the Wet-plate Collodion process to make Tintypes. For Christmas, I also received a Lund Photographic conversion of an 8X10 film holder to handle Tintypes. Looking forward to trying the process. I am so happy to have bought nothing. The freezer has enough film for the next decade. We are in the middle of Santa's gift of 5 days in a row of around 40c heat. Too extreme to even go outside to take pictures. I got a new fangled coffee press thingy from my brother which is apparently all the rage in Melbourne these days. You must have been naughty, eh? After gaining my parents' 1957 Zeiss folder last year, this year they found and gave their old Olympus Trip. Like the Zeiss, it's had a film left in it for a very long time. Though this time it hasn't been exposed, so no more hidden memories in this one! A 40mm lens on it too - a favourite focal length. "My future daughter-in-law gave me a coffee mug that looks exactly like a 28-135 zoom lens. The detail is amazing... "
You'll have to report back later with a review of the Mocha Bokeh, Ed. 10 propacks of ektar 100 120 film. The price was too good to pass up, and I needed some anyway. I got my usual Christmas "gift," a lot of needless family drama. On the plus side, I bought my mother (who is also an avid photographer) the fish-eye lens she's wanted for a number of years. Never underestimate the power of a fun lens. A copy of Roy DeCarava's "Sweet Flypaper of Life", a copy of Saul Leiter and the Sony DSC-RX1. I got a Panasonic G3 kit from B&H before they went out of stock using birthday and early Christmas money. I've been working with it off and on, getting comfortable with the white balance and exposure compensation. I also picked up a body cap lens and a Gorillapod to go with it... the two of the big things I learned from my point and shoot are that tripods make everything better, and the smaller my camera is, the more likely I am to use it. I also learned that image stabilization does not cure a vibrating photographer, thus my fondness for tripods. It reminds me a lot of the Nikon film SLR my Dad used in terms of size and handling. The size part is definitely good. Most digital SLRs seem a lot larger than what I was used to with film. I'm one of those people who would prefer you didn't get me anything related to photography. It's almost always useless. Those who know me ask. This year I was want for nothing. So I got a Nook reader. I love books so this will work just fine. I did go to a Barnes & Noble to look for a cover for the Nook. Way, way over-priced. But I did see the table top book: 'Totally MAD: 60 Years of Humor, Satire, Stupidity and Stupidity' and that I bought as a Christmas present to me. 60 years of Mad magazine. All I care about is the 1950s. Classic Mad. I can't wait. A 15mm 'lens cap lens' for my EM-5. Turns that $1,000 digital camera into a Brownie Hawkeye. Neat. Ordered it early, barely got here in time for the holidaze. Managed to NOT run up the credit card by not "gifting" myself a lusted for Fuji X-100. Glad to see you took a few days off, Mike. Also glad you're back. I bought myself a copy of Eliot Porter's Intimate Landscapes still in the original shrinkwrap or whatever it was called in 1979. I can't quite explain the buzz from opening a book that has sat for 33 years waiting to be seen. Today, In the Realm of Nature arived, my cup runneth over! Don Hudson's "From the Archives" and Zisis Kardianos' "A Sense of Place". And stomach flu, including a day in the emergency room. I got a Lionel train set that belonged to my grandfather - a photo project in and of itself. I got pants, which are good to wear when taking pictures as opposed to wearing a brace of live badgers gaffer taped to your midsection." I'll keep on returning it till Ricoh get it fixed or replaces it with a new unit. As a result of which I'm going to get another M mount lens module. For quick "magazine" lens changes in the field. Ever the optimist, I hope I just got the only bad sample in the old one. So, there. I think that's how I should put it to my wife who's beginning to ask already, when or if my GAS will end. As for an alternative camera body, say, the Nex 6... maybe next Christmas. *There's something wrong with the Mount A12's shutter. It blacks out (remains shut) every other shot (like you were shooting with the lens cap on). I could work around this for landscape shoots, but it puts paid to the camera's continuous mode, bracketing, and time-lapse features. Besides, the M mount is too expensive to be considered a disposable M lens "adapter". Got a "new" Kodak Brownie Twin 20. Time to re-spool some film! I'm still waiting for Santa to bring my 2012 Ural Yamal. I don't know what's taking him so long. He could just head up the street to San Diego BMW they have one there waiting. A used 35 Summilux ASPH to replace the one that I stupidly sold a couple of years ago. I gifted myself up a copy Robert Frank's "Valencia", focusing on his time in the Cabanyal area of the city in 1952. My understanding and appreciation of his life and work, continue to grow, as I learn more about him. This documentary may be of interest to some readers. No camera gear, but something I'm pretty dagang happy with: a Highway 49 tenor resonator from Republic Guitars of Rowlett Texas. Mm-mm. I got "Still Life:Inside The Antarctic Huts" full of wonderful photographs and an Olympus XZ-1. It's a wonderful little camera which works very well with my FL-36 flash used wirelessly as an off-camera flash. Great for party shots indoors..... One thing i've recently noticed though is that Lightroom doesn't appear to have any profiles for any Olympus cameras or lenses...... why so??? My wife got me Infra by Richard Mosse. Definitely not for everyone, but I'm a total sucker for photos made with Aerochrome (RIP). Olympus 17mm 1.8 came just in time. At the company holiday party I received the Sunshine award for my positive outlook (joke's on them. As has been attributed to many, but I prefer to honor Jimmy Stewart: The most important thing is sincerity. Once you can fake that, you've got it made). It came with a $50 prepaid American Express card, which funded 5/6ths of the Olympus 15mm Body Cap Lens for my EPL-1. Santa brought me the Eliot Porter book In the Realm of Nature. I've ordered the Lomography 6x12 folding camera. Apparently someone is making whisky in Brooklyn and my wife bought me some. No photo related gifts, but I did find a copy of Ansel Adams "The Negative" and a shoebox full of light-meters on the sidewalk when I was walking to my sister in law's for breakfast on Christmas. So what is Dave going to use the Fuji PA 45 instant film holder for? I was wondering since I finally built a couple of 4x5 point and shoot cameras using Polaroid 545 backs I had been promising someone and that very moment Fuji stopped making conventional film Quickloads and 4x5 instant film. I looked up the New55 project and not much news other than Efke seems to have stopped making film and paper. I got a Nikkor 50/3.5 Rigid LTM and a Nikkor M 300/9 from ebay. What I got was not told to shut up when I mentioned buying a new camera. That only lasted for Xmas day though. I gave away seven different photo books. The effort contributed to a Christmas spent exhausted and queasy. Ah, a Holga! First decent camera I've seen on this site in years. The giver presumably knows a bit about photography. The hirsute old fat bloke in red brought me Panoramas of Lost London. It's full of photos taken between 1870 and 1945, of areas that were due to be redeveloped. It's about 12 X 15" and as one Amazon reviewer says, it's a coffee table book that weighs more than the table. Many of the photos fill the page and there's lots of detail to be seen. After my 8 year old granddaughter produced a detailed two page wish list for her extended family, I followed suit with 3 items; B&W 120 film, 35mm bulk loading supplies, and a Nikon FG & 50mm f/1.8 lens combo. I received all of the items from my wife, which was a good thing, because my film 'fridge was nearing empty and my top shelf "needed" a compact 35mm SLR that would travel well in my motorcycle's saddlebag. A Seven5 Lee filter holder starter kit !!! Exciting stuff ! I got the Nikon AF-S 85mm f/1.8 G as well as gift cards to Henrys to get more photographic goodies. :) I'm loving that lens, razor sharp images on my D800. A Pentax K01 body (black; can't deal with day glow colored cameras). My intention is to use it like my MF film camera (working slowly and thoughtfully)for landscape, architectural and macro work. If it goes well, my film days are probably over. Also got a fur lined plaid hat with big ear flaps.Too bad I don't ride the subway anymore; this would be perfect. Some really nice cigars and a beautiful humidor; not politically correct, but very pleasant. Nothing so far but my wife is going to 'help out' with a purchase, so it's looking very like I'm going to be exiting film photography, via a Panny GX1 or Oly E-PL5, then selling off my Contax 159 and Zeiss glass to get a couple of mft primes. I also have been exploring DACs and had considered the Schiit box. The Emotiva offering is a little more appealing to me, and not just nominally. But can't do either right now. They're distractions; neither one will help me make photographs!! guess i was nice this year? picked up a mamiya c220 and as a bonus, got a konica auto s3 with it. i'll be getting a horseman 450b in january as a delayed (by 2 years) gift. that's 3 film formats, and 3 viewing options in one fell swoop. so just to get early in line for 2013, i only ask that santa brings me a LOT of film. A ticket to the Ansel Adams exhibition at the the Greenwich Maritime Museam. I went this morning. So you WERE naughty, then. I usually ask to not receive camera gear, but this year, I asked for, and received a 105mm DS lens for my Mamiya TLR. This is the only lens in the system with an iris on the viewing lens to sort-of-preview DOF. Most exciting to me is that it also has a self-timer on the shutter for all the wonderful and hideous things one can do that such a device! Not much of a camera but man, it flies! A Google Nexus 7 to share my photos and 20 packets of genuine Kodak lens cleaning tissue. A new anisotropic shader and a new strand render technique.....all for free (or for what you wanna mis) from www.graphicall.org and www.blender.org. And thanks to all the believers in the word "Open" as in "Open Source" (and to Google for the Summer of Code) I'm happy as a clam. It's about as un-automated as a camera can be, but has roughly a bajillion megapixels. No weather proofing, so I'll have to wait for the snow to stop. A pair of Grado SR80i headphones. Not super audiophile, but as good as it gets in my families budget, and a big step up from the pair of Sennheiser's that broke last month. Mike (and Christine): I also sold my Metz Mecablitz 58 AF-1 (and color filters, and radio trigger. I think I might have been in it for the gear*.). It's a wonderful unit. Makes flash pictures look like pictures taken without flash. Also makes the camera even heavier, resulting in me using it even seldomer. *: I was also in it for the product. Not for the process, though, which left the product side quite wanting. I did take one photo I really, really like, though, which is better than expected. It was an accident. I'm counting myself lucky, and moving on. I'll still visit TOP though, even if only to skim the headlines for interesting Off Topic stuff. I got a Fuji Instax instant camera! And the film for it costs 15 dollars for 20 exposures- expensive, but think of it, not so much more than processing and prints from a 24 exp roll of 135. I ordered the Olympus 15mm/8 lens cap in September. It arrived about a week before Christmas. My wife grabs it before I have a chance to open it -- "Not so fast!" She wraps it and puts in under the tree with a tag from her to me. Merry Xmas, honey! My daughter gave me Errol Morris' "Seeing is Believing," which I had put on my wish list thanks to this site. So, thank you. I decided that the only way to get some gear that I wanted was to buy it myself. Since I have plenty of out-dated 120 film in my freezer I decided to get a film camera and use it up. Decided on a Mamiya C330. Got it and two lenses (55mm and 135mm), then decided for no good reason to get an 80mm. Have used it only once but I have not had much opportunity to get out yet. Also bought on eBay a Sawyer Mark IV, which uses 127 film. One was stolen from me over 30 years ago and I was awfully fond of it. B&H has 127 film. Have not used it yet as the viewfinder needed work so I sent it to Ken Ruth at Photography On Bald Mountain, who of course did a great job of setting it right. I head to Yosemite at the end of January, with three cameras, including my 5D Mark II.